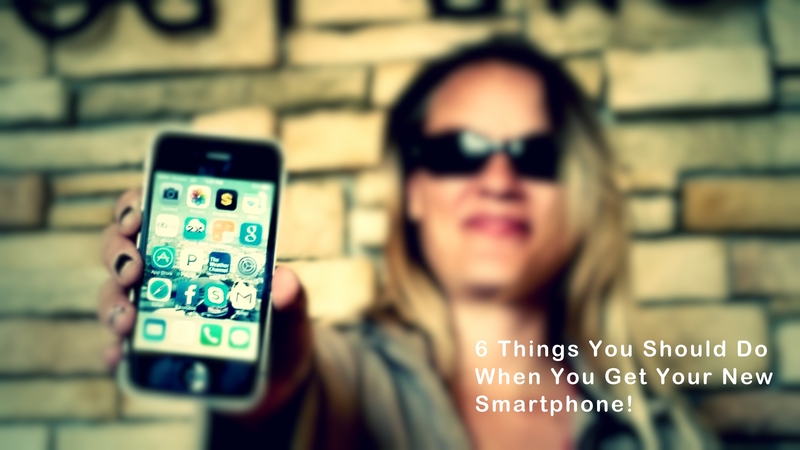 6 Things You Should Do When You Get Your New Phone! So, you’ve just opened the box to your brand new smartphone – or maybe it’s your 5th. These devices have long moved past being phones and are now your mobile office. They’re a computer, phone, and camera all in one. So what do you do with it now? Here are some ideas to get you started. Customize the look and feel – I like to set up wallpaper that’s personal to me, color schemes that I like, and organize the icons to ensure the apps and features I use the most are easily accessible. (Don’t know what you’ll use often yet? Take a couple of weeks and you’ll learn your access habits. )When updating your wallpaper on an Android device, touch and hold an empty space on the desktop, select “Wallpaper” and follow the screens to pick your image. For iPhone users, go to “Settings” off of the home screen and then select “Wallpapers and Brightness.” Check out Tech Hive’s article for more Android customization tips and tricks. Install a Find My Phone app – We’ve all had the sinking feeling that we may have left our phone in the taxi, at the restaurant, or who knows where. iPhone and Windows 8 mobile devices have a Find My Phone feature built into the operating system.Android users can download one of many good Find My Phone free apps like Alienman Technologies’ Wheres My Droid. If you’re part of a business or corporation, centralized mobile device management services are your ticket to making sure your important stuff doesn’t get into the wrong hands. Figure out how to use your camera – Today’s smartphones can take stunningly beautiful pictures. Utilize filters to liven up boring shots and set up instant share (to platforms such as Facebook and Twitter) to show off to your friends and family. Many devices have the ability to use the camera without passing through your lock/logon screen. This saves time when that perfect photo opp presents itself. Set up a backup – Want to keep those pictures of your awesome friends and family? An inadvertent reset to factory settings will delete everything you created. There are several cloud based backup solutions through your carrier that allow backup and restore of these items. I’m a Verizon customer and use their Backup Assistant tool. AT&T also has a similar tool called Mobile Backup. Look for Mobile Device Management services – For the business smartphone user, centralizing management of your smartphone army can save time, money and headaches. Most commercial mobile device management services include easy ways to automate setting up corporate email, applications, encrypting the device for storing sensitive email or files, and the ability to remove, wipe, or deactivate phones if they are lost or stolen. Well worth it! Re-introduce yourself to your significant other – Remember that person that you used to talk to and do stuff with? Yeah, now would be a good time to put down the smartphone and reconnect with them! Ken Satkunam is President and founder of NorthStar Technology Group, a leading Information Technology firm in Fargo, ND. Since 1994 Ken has served nearly every IT role from technical support to CIO for organizations as large as 23,000 employees. His current role is to provide leadership and direction to his passionate team of engineers and strategic direction for NorthStar’s valued clients. Ken has been quoted in leading industry journals like eWeek and DM News on various technologies.